As inspired by Shaw’s whimsical comedy, You Never Can Tell, Noel Coward aspired to be the ‘new’ Shaw with I’LL LEAVE IT TO YOU! 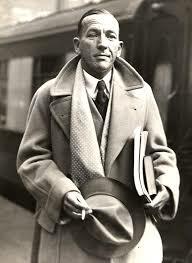 That was until he arranged a meeting with GBS who set him straight, assuring him that a Noel Coward would offer a far more compelling voice than yet another Shaw wanna-be. ‘Be yourself, everyone else is taken.’ So Coward wrote this rarely seen charming opus, which we’re thrilled to offer on what will be his 120th birthday. The performance will be followed by a festive party with Coward music in the adjacent Bar Thalia to celebrate the holidays and the New Year! THE PLAY: Left a widow with five grown up children, Mrs. Dermot turns to brother Dan for help. Uncle Dan arrives to find an idle family ready to live on his money. He announces that he is doomed to die in three years and that he will leave his money to the member of the family who has made good by then. Each sets to with such determination that Oliver becomes a successful inventor, Evangeline a novelist, Bobbie a composer and Sylvia a film star; even Joyce, finishing her school career, distinguishes herself. Now he tells the family his riches are a myth and his previous announcement was only a means to raise the family from lethargy. Sylvia alone sees Uncle Dan’s wisdom and berates the others for their narrow minded attitude. At heart, they are all genuinely attached to the wily uncle.